Portland is what (food) dreams are made of. At least for me. 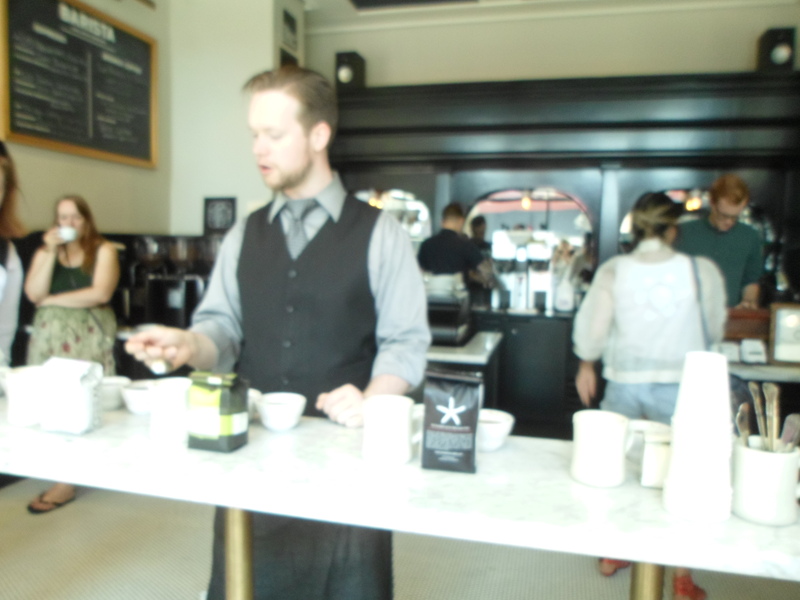 When I was researching things to do in Portland I came across the company Third Wave Coffee Tours. I was ecstatic. We all know how I feel about coffee. I simply don’t want to live with out it. I was excited to learn the recent history of coffee in the area and get to try out some different types. They graciously offered to host me on a tour of their city. Third Wave refers to the relationship that these coffee sellers have with the countries in which they receive the coffee from, Instead of just fair trade, which is to ensure that people are making livable wages off the coffee beans they are picking these third wave coffee distributors go a step beyond and actually form relationship with the growers. Forming relationships with the people and countries they buy from. 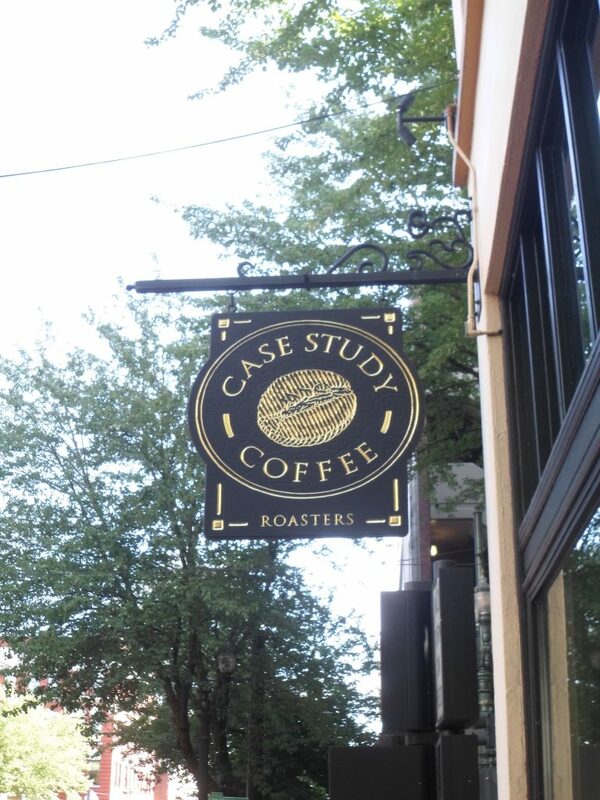 Our first stop was at Case Study Coffee. There are several Case Studies through out Portland now but it originally started with just one and has grown over the past decade. Case Study is unique in the fact that one of their owners/roasters is a woman. Only 10 percent of roasters are female. Girl Power! Not only are you trying the coffee on this tour you are learning the history of how this third wave roasting came to be and watching demonstrations on what the difference is between a french press or a regular drip. I really enjoy the French press as it turns out a darker brew. I prefer my coffee dark and I never take milk and rarely use sugar. I love the actual taste that the beans display. 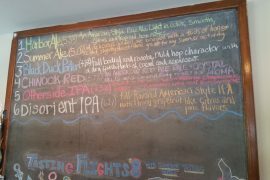 It was great to be able to try so many different brews. That is why it was so surprising when my favorite sample was a flavored latte. 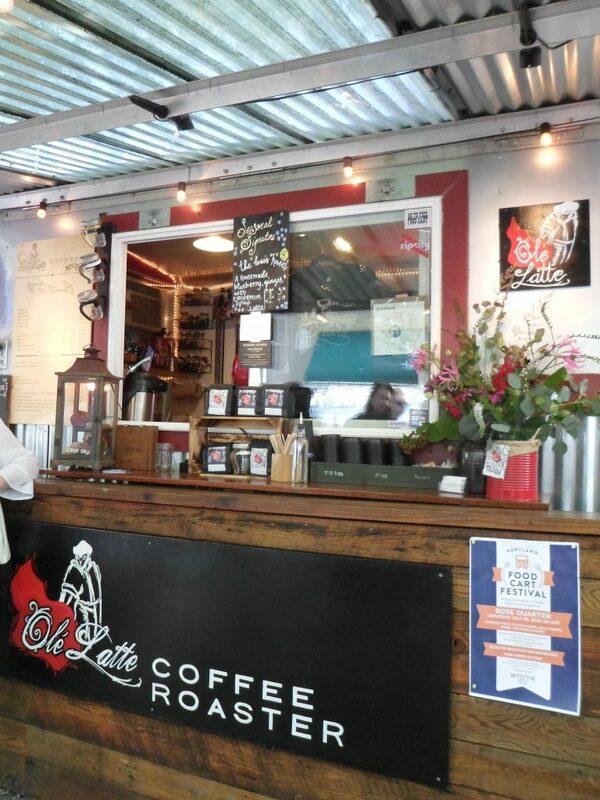 Our second stop was a coffee cart called Ole Latte. 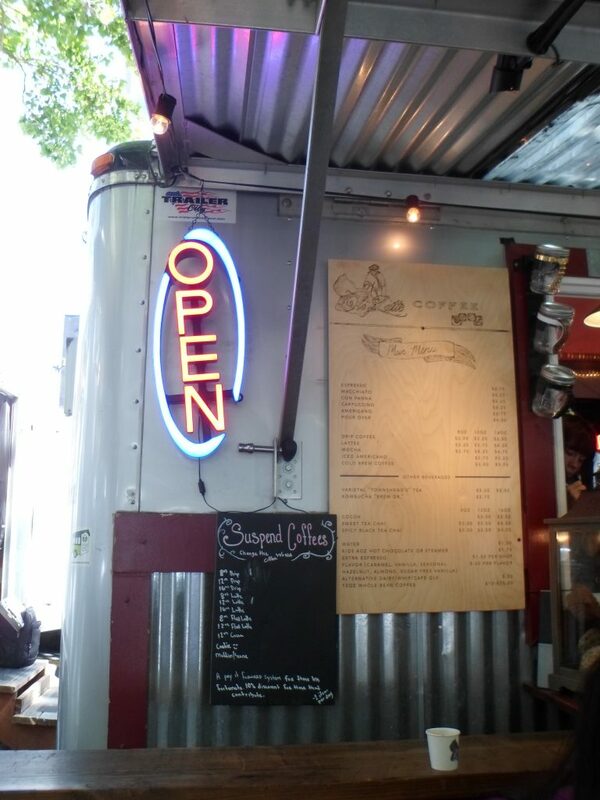 With food trucks being the best way to eat in Portland it is really no surprise that a coffee cart would be available. The guy running the cart came out to talk with us about his company explaining he has a pay it forward system that allows you to pay for an extra cup of coffee or a latte. You receive 10 percent off your purchases and your contribution is written on a chalkboard for the public to see allowing a less fortunate person to enjoy a cup if they can’t afford it. Such a beautiful concept. The latte they gave us to sample was called The Bees Knees and it was a blueberry ginger latte. It was so flavorful and a unique combo. I certainly recommend that if you are in Portland you swing by this cart. 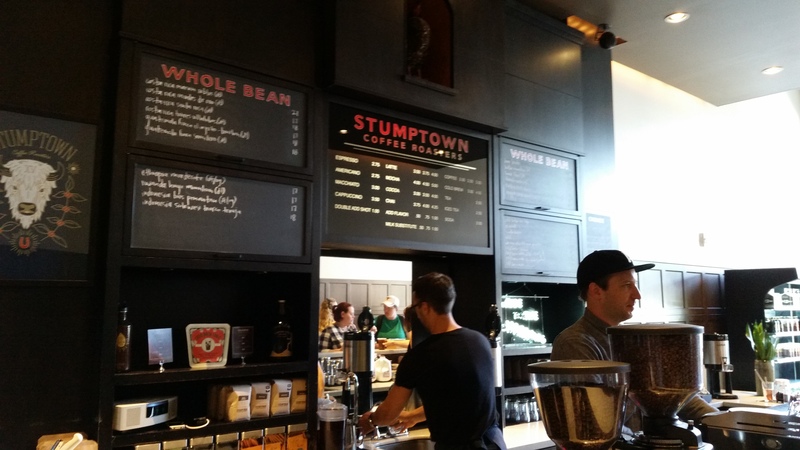 No coffee tour in Portland would be complete without a stop at Stumptown. It is the original third wave coffee place and now is a well known name in coffee. Even branching out to my coast. I recently went to a coffee shop on the east end of Lon Island who sold only Stumptown coffee. They are recently marketing their take away cold brew and we got to try it out. I usually prefer hot coffee solely for the reason that I drink cold brew way too fast. However I loved their cold brew! The flavors were bold yet sweet. Courier coffee is a small, basic shop nestled close to Powell’s book store. Their coffee was impressive but their pastries are out of this world! I had a salty chocolate chip cookie that was to die for. It was great walking around the city with a knowledgeable guide. The company does such a great job of really making you understand what goes into the coffee you drink. Each place we stopped at was different then the prior. A lot of these places I would never have found on my own. There are so many coffee options in Portland it was useful to be pointed in a good direction. 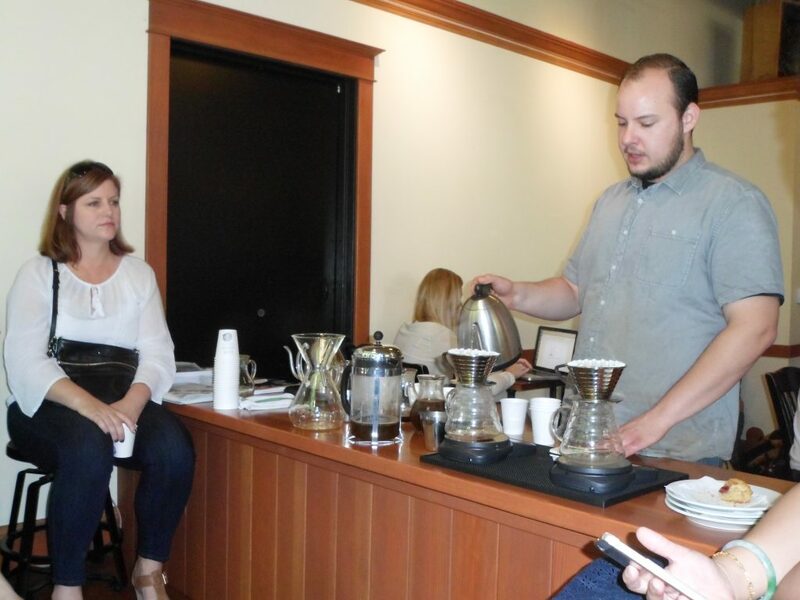 Third Wave Coffee offers a variety of tours. I took the Downtown Portland Coffee Tour which is great for getting to know the city and all the coffee it has to offer. It is every Wednesday at 10am. 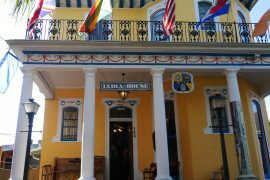 Check out www.thirdwavecoffeetours.com for a listing of their tours with times and pricing.